One of our hospice patients was SOB. No, I didn’t say that patient was a son-of-a . . .! Like scuba (Self-Contained Underwater Breathing Apparatus), Nabisco (National Biscuit Company) or a laser (Light Amplification by Stimulated Emission of Radiation), the hospice/medical use of SOB is an acronym. Which is to say the patient was short of breath. When a patient’s medical history is recorded, acronyms play a key role in sharing and keeping information brief. Until I started working at hospice, I hadn’t seen MOM used for milk of magnesia . . . but there it was, betwixt lasix (a medication dealing with water retention in the body) and MSIR (morphine sulfate instant release). Under any circumstances, being short of breath is scary. 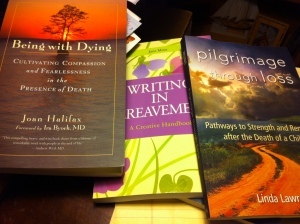 Books about dying, death, and grief surround me in my office. There are additional like-minded books in digital form on my tablet. Do any of them truly help me understand the grief I’ve experienced in my life, or help those I try to support as they grieve a loved one’s death? And what about the workshops, seminars, and webinars I’ve attended? Helpful? Not helpful? Not long ago, the hospice where I work sponsored a Saturday conference on grief. There were workshops, from hands-on experiences like creating memory scrapbooks to offering current research-based insights into the whys and whats of grief. A labyrinth was available for walking, inviting symbolic journeys for individual reflection. I co-lead a section on writing to explore personal grief through words. I think most participants had a meaningful time. However, I’m confident many knew about the conference but were “no shows.” Maybe they wanted to take part, but didn’t possess the energy to leave the house. Maybe they wanted to take part, but hesitated about going alone. Maybe they wanted to take part, but couldn’t stand the thought of being around others. There might be strangers present, which could be overwhelming. There might be friends present, which could be overwhelming. They didn’t want to cry. They didn’t want to be around others who cried. They were afraid there wouldn’t be anything worth learning. They were afraid they might learn something and be confronted with change.